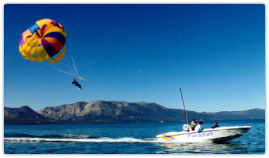 Lake Tahoe is known for being the prime destination for year round recreations with some of the best activities and outdoors destinations in the world. Lake Tahoe is a massive freshwater lake that sits on the northern border between California and Nevada. Being a prime destination for tourism, Lake Tahoe homes and real estate are highly sought after investments due to their solid rewards and opportunities for returns. 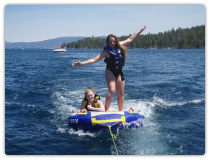 Lake Tahoe offers a variety of recreational opportunities all year round regardless of the season. With a dazzling natural lake and majestic mountains views and scenic backcountry, Lake Tahoe allows you to participate in a variety of outdoor activities. During the summer or warmer seasons, people go boating, swimming, jet skiing or other water activities on and around the lake, while in the colder seasons lets sports enthusiast ride the slopes of the ski resorts that are famously known across the country. As a lake resort area in the largest alpine lake in North America, Lake Tahoe natives have much to enjoy all year round. 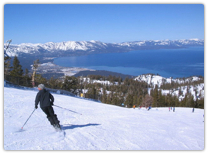 Lake Tahoe is a wellspring of stimulating recreation along the Sierra Nevada Mountains. Days here in Lake Tahoe provide opportunities such as leisurely trips to the lake, a peaceful morning along the wilderness, or an afternoon of shopping at fine stores and unique retailers. Nighttime supplies a vivacious nightlife including fine restaurants and buzzing entertainment. As a prospering area, Lake Tahoe real estate is a sought after market. Browse Lake Tahoe real estate now and contact Pam Lusby today for guidance in the current market. When trying to find Lake Tahoe homes for sale, please feel free to use the convenient search features on this website to view Lake Tahoe MLS listings. Lake Tahoe has a wide-range of real estate online for everyone to choose from, whether it´s a residential home, rental, vacation property, lake front home or custom property, you are sure to find it. Additionally, after selecting a comfortable residence, you can also zero in on the closest school, get useful info to attractions, places of interests and demographics on the local neighborhoods by clicking on the "Neighborhood Info" tab on any listing. Email or call Pam Lusby, Lake Tahoe Realtor today for help. This is a one-stop real estate website for all your home buying and selling needs in Zephyr Cove, NV.